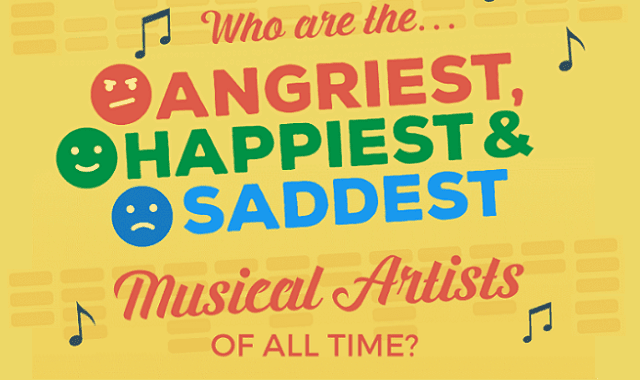 Who Are the Happiest, Saddest And Angriest Music Artists of All Time? #Infographic ~ Visualistan '+g+"
Like all art, music is highly emotional and subjective. Often, the music we listen to matches our mood. Recent break up? Put something sad or angry on. But when the sun is shining you want a tune to accompany the good times. With this mind, we ran song titles and lyrics of some of the world's most popular musical artists through IBM Watson's Tone Analyser to determine their overall mood. Just how happy were The Beatles, can Coldplay shake their slightly dull reputation and is Kanye as confident as he likes to make out?